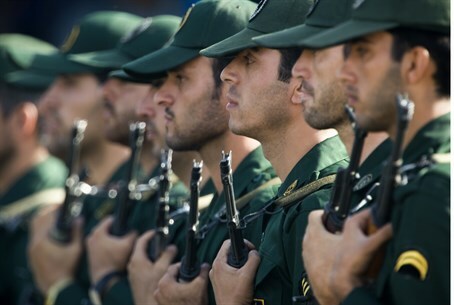 Iran's Revolutionary Guard taunts US, West that Iran would win in the event of a military strike. Hossein Salami, commander of the Iranian Revolutionary Guards, threatened US, the West, and Israel in a televised interview Saturday, according to Maariv. "If the Islamic nation would unite, it could minimize the breathing room of the US and the West until the Zionist regime would no longer have room to breathe," the commander threatened on Iranian state television. Salami downplayed the possibility of a military attack against Iran, while noting that the US stated recently that it is leaving a military option on the table. "We also have strong military capabilities that can attack and destroy [our enemies]," Salami boasted. "We can threaten the interests of major powers in every arena; but during the diplomatic negotiations we are not talking about military power." "Americans are wrong in their assessments [of Iran], which leads them to adopt mistaken policies," he continued. "They need to look at the distant past and learn their military might not yield results. If they think that by means of threats they will make us retract our positions, they are wrong." Salami was nonchalant about the possibility of a military confrontation. "Can they [the US] withstand a total war against Iran? Would they be able to protect their many interests during an attack against Iran? Can they protect energy security in the region? Can they defend their naval ships and the security of the Zionist regime?," he asked. "The United States can devise an airstrike or ground strike or launch missiles at us," Salami boasted. "We've analyzed all the possibilities and we have plans for winning each one. We analyzed the US's military strategy and strengthened our capabilities and identified the weaknesses they have that will shock the United States [when they lose]. All the enemy's military bases in the region are within our range." "If anyone attacks us, we will not hold back when we wage war," Salami threatened. "We will injure the US until it falls." The threats echo remarks made by Ayatollah Ali Khamenei last week, where he warned the US to "show self-restraint" after US Secretary of State John Kerry told Iran that a military strike could still be possible.